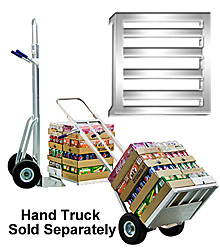 An innovation in pallet design, this all aluminum hand truck pallet rides on the nose plate of the hand truck, allowing larger loads to be carried more easily without have to de-palletize or jostle them to lift. The pallet is lightweight, yet sturdy enough for use when on route deliveries. Helps reduce damages to products and keeps hand truck nose plate from damaging floors because the hand truck nose plate goes under the pallet opening instead of against the product and floor to get under the load. Great for transporting bagged goods.